A high school and recreation complex in the PanAm precinct would be a boon not just for its surrounding families, but for the lower city's underserved seniors, says Hamilton's city manager. A high school and recreation complex in the PanAm precinct would be a boon not just for its surrounding families, but for the lower city's underserved seniors, Hamilton's city manager says. 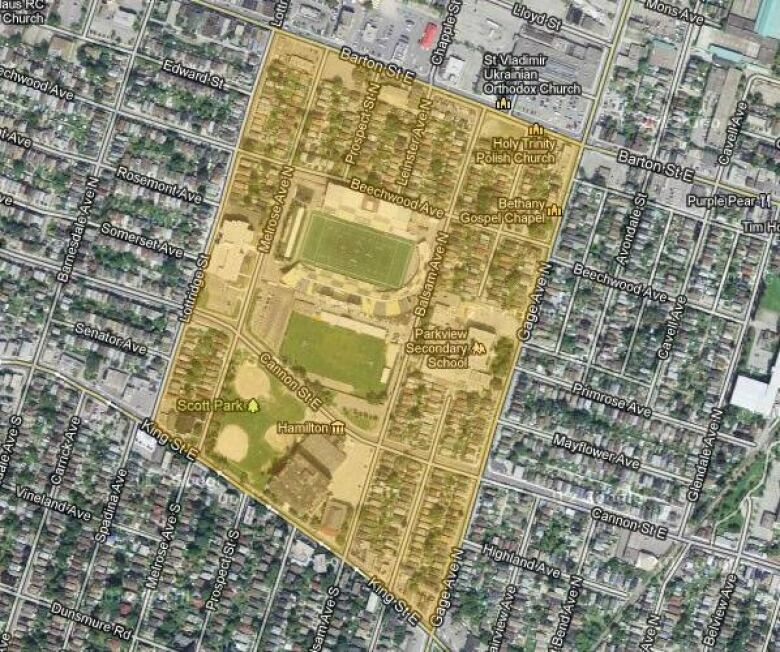 Council voted Wednesday night to investigate partnering with the Hamilton-Wentworth District School Board on an east-end complex that could include a high school and rec centre. Chris Murray says it could also include much-needed seniors' space. "There's a basic lack of an appropriate seniors' facility in the lower city, so this could serve the needs of a number of people," he said. The school board has received $31.8 million from the province to build a new lower-city high school, which would replace Sir John A. Macdonald, Delta and Parkview schools. The board needs to finish the school by September 2016, so it needs a binding agreement with the city by March 27. Murray will report back to councillors on March 20. The city and school board have been discussing options for "several months," he said. Last fall, city staff surveyed residents in the area, who said the neighbourhood needs a school, recreation facilities and more for seniors, Murray said. The project would be located between Lottridge, Barton, King and Gage streets. The parties have discussed locations, including Scott Park, but the school board will ultimately acquire the land, he said. If councillors vote on a partnership, the two sides will work out other variables such as design and the cost to the city. The complex could be "one of the key things that's going to help lift this neighbourhood," said Steve Calverley, chair of the South Sherman Community Planning Team. "Folks in the neighbourhood are quite delighted about this prospect." The area does need more amenities for seniors, Calverley said. He also envisions the area, with its new PanAm stadium, as being a sports hub for the city. That includes amateur sports. "It would bring new life into a neighbourhood that is already enjoying some new life," he said. The preference for Flamboro Downs as a casino location, with other areas of the city considered only if it can't happen in Flamborough. The decision for the city to send a Light Rail Transit (LRT) plan with the request that the province pick up the cost of the project, which could be as much as $800 million.